Latest agricultural technologies will be highlighted at Bahrain's most colourful exhibition next week. The 10th annual Bahrain International Garden Show (BIGS) will open on February 26 at the Bahrain International Exhibition and Convention Centre, said a report in the Gulf Daily News (GDN), our sister publication. The expo, which is held under the patronage of His Majesty King Hamad, is organised by the National Initiative for Agricultural Development (NIAD) in collaboration with Tamkeen and United Nations Industrial Development Organisation (Unido). It will focus on incubators, rooftop gardens and kitchen gardens with a specific attention to incorporating agriculture in urban development. It will feature a variety of exhibits, green displays, a small farmer's market, innovations and workshops, said BIGS general co-ordinator Shaikha Maram bint Isa Al Khalifa yesterday. 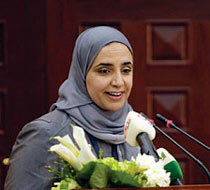 She was speaking at a press conference held at the Kempinski Grand and Ixir Hotel, Bahrain City Centre. She said she picked the names of six farmers at random to take part in the expo. "The tenth anniversary is an occasion and a celebration and an opportunity to look back on everything we've accomplished in the last 10 years and look to the future to know what we're going to accomplish in the coming years," she said. "Our theme this year is agricultural technology because it provides solutions to the issues that the agricultural sector face, namely lack of land and water. "We're focusing on five areas - green walls and green roofs, kitchen gardens and incubators, water production and treatment, and urban planning of future cities. We have modern green houses that focus on technology. "People have also started to incorporate green walls as a solution to lack of land, and a way to incorporate them into modern buildings. If there are no gardens on the ground level, roofs can be utilised." She added that kitchen gardens, through incubators, are also a possibility. "It may sound futuristic, but an incubator can be used for herbs and vegetables and even some flowers," she said. "As for water production and treatment, there will be solutions for small locations, small farms and houses and solutions on a large scale for countries. "The last area of focus will be urban planning - we are hoping to look to the future and see how agriculture can be ideally incorporated with urban development, bearing in mind the challenges, land, water scarcity and harsh conditions pose." With 130 exhibitors and an exhibiting space of 7,500 metre square, Shaikha Maram said it was the biggest number of participants in the show's 10-year history. "At 130 exhibitors, it's the biggest show size-wise in the history of the show," she said. "Last year we had over 16,000 visitors, and this year we hope to maintain and surpass those figures." Unido head Hashim Hussain said their involvement this year comes under Manama being named the Arab Capital for Innovation and Entrepreneurship 2014. "We will have 15 Bahraini entrepreneurs and 15 regional Arab entrepreneurs from Iraq, Sudan, Tunis and other places," he said. "There will be companies from Italy and China too at the Unido pavilion. "We will be focusing on three subsectors that Shaikha Maram mentioned, which are incubators, rooftop gardens and kitchen gardens." Registration for the 49th annual Amateur Flower and Vegetable Competition, which runs alongside BIGS, is still open, said Bahrain Garden Club (BGC) chairwoman Zahra Abdulmalik. Adults who wish to take part have until February 23 and children have until Wednesday to sign up for their categories, while ministries have until today for the best ministerial garden award. The competition consists of 83 categories. Australian abstract artist Christopher Hoogan will once again conduct workshops at the expo for adults and children alike.